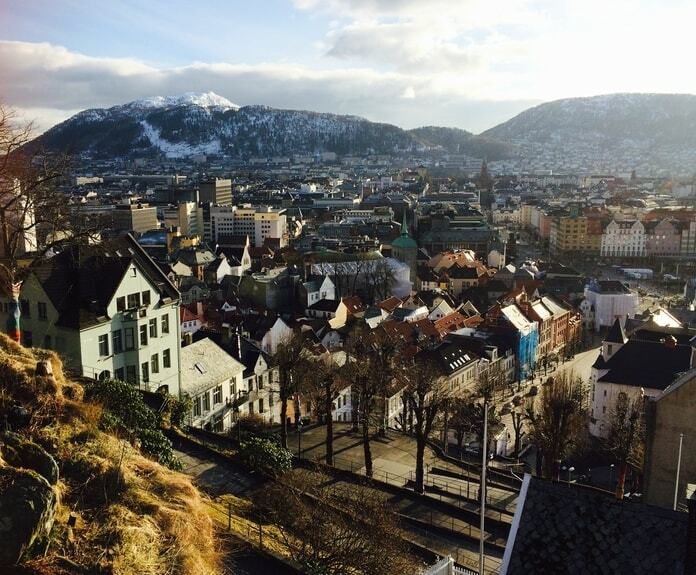 Bergen is my favorite kind of city, small and beautiful in the center, on the coast, and surrounded by nature. It has everything you need – mountains, ocean, atmosphere, history, beautiful streets and friendly people. A small, hidden place burrowed within the epic nature of Norway. At times, the nature of Norway seems never-ending. And that’s from the perspective of just one small city in the southwest. The country’s scale is incredible. It becomes truly remote in the north, and yet the south is still almost uninhabitable. 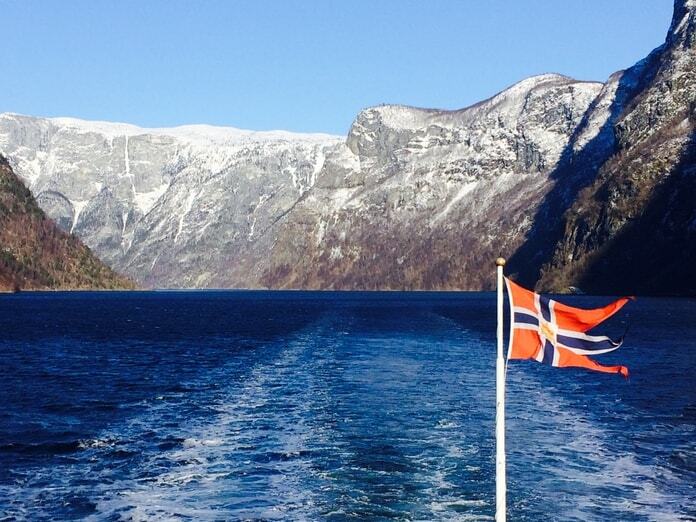 For 323,802 km² of land, only 5 million people live in Norway, half the population of London. Due to the sheer and jagged layers of the landscape, with its high mountains and steep fjords, it was always difficult to build large settlements. The result is almost untouched scenery, raw and wild, and dotted with small villages of red wooden houses beside frozen lakes. 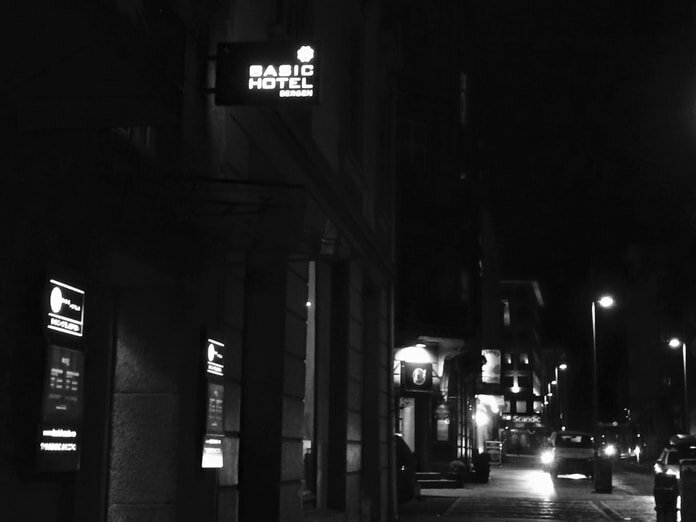 When I was in Bergen, I stayed at Basic Hotel. It was the perfect location in the center of the city. A wonderfully comfortable break from hostel travel, the hotel was an affordable luxury. Without paying much more than you would for a dorm bed, Basic Hotel gives you an incredible resting place with top facilities. 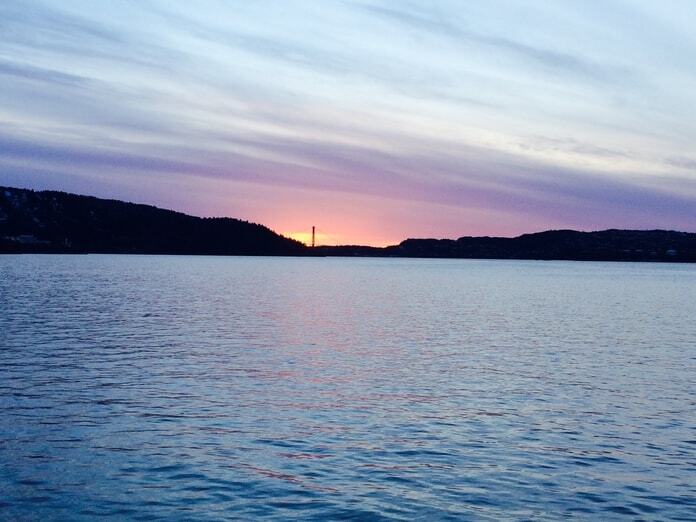 The hotel is close to everything in Bergen – the harbor, the headland, the center. It has a welcome and friendly atmosphere, with wonderful staff. There is a kettle and fridge in your room, to make yourself feel at home, and coffee facilities in the building. Clean and cozy, its quality services will allow you a proper rest, with the energy to move onto your next adventure. 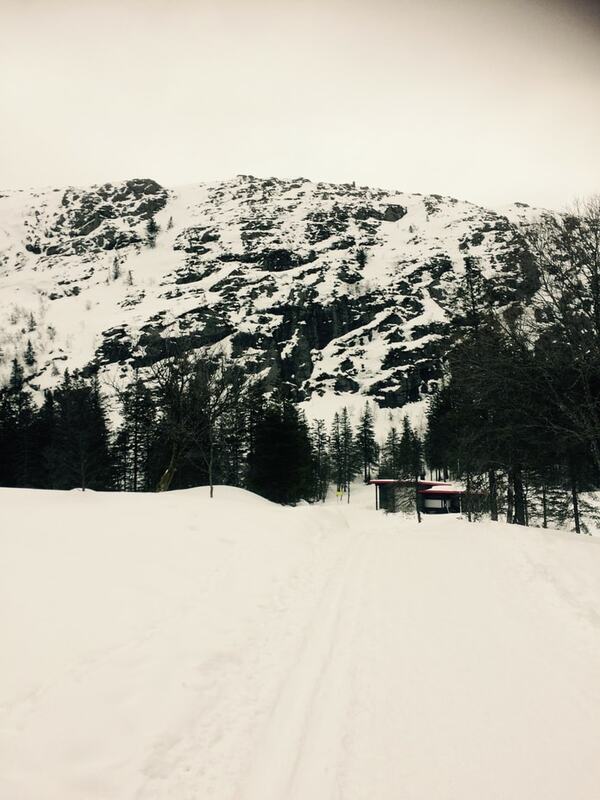 Bergen is a place of outdoor activity and after a long day of skiing, hiking or exploring Norwegian nature, Basic Hotel is the ultimate place to relax. 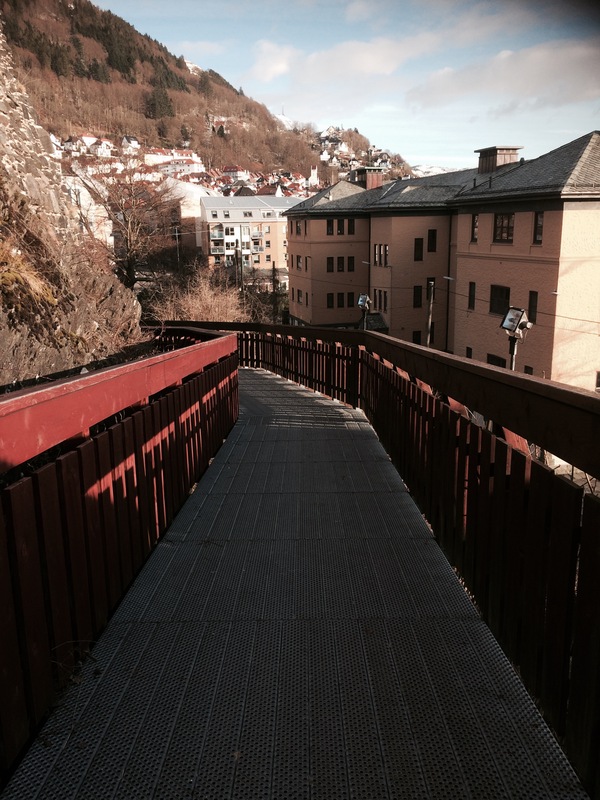 Byrggen is the top thing to explore in the center of Bergen. 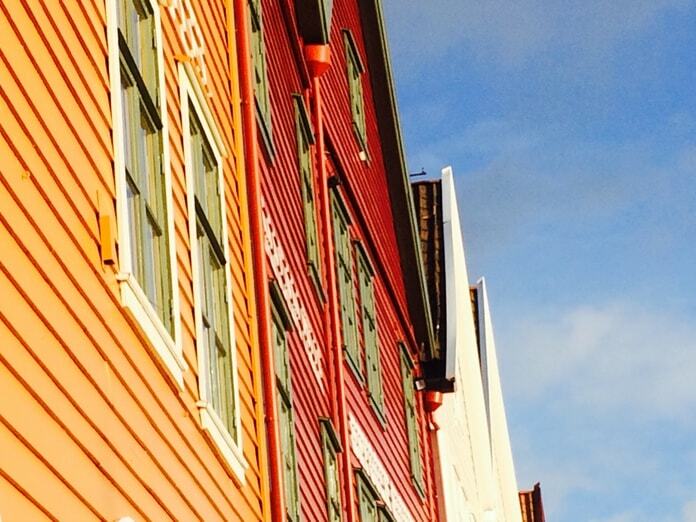 It’s not easily missed, with its colorful, wooden houses lining the waterfront. It’s a UNESCO World Heritage Site and still-developing project. Every element of the area is either preserved or reconstructed in its original form. Even the tools used to rebuild damaged parts are consistent with the culture of the Middle Ages. Bergen was once the center of trade for Norway, and Bryggen was the center of Bergen. Although it faced fires and reconstruction over the years, the foundations are still from its 12th Century roots. 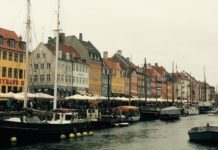 You can learn more at The Hanseatic Museum or Bryggens Museum. 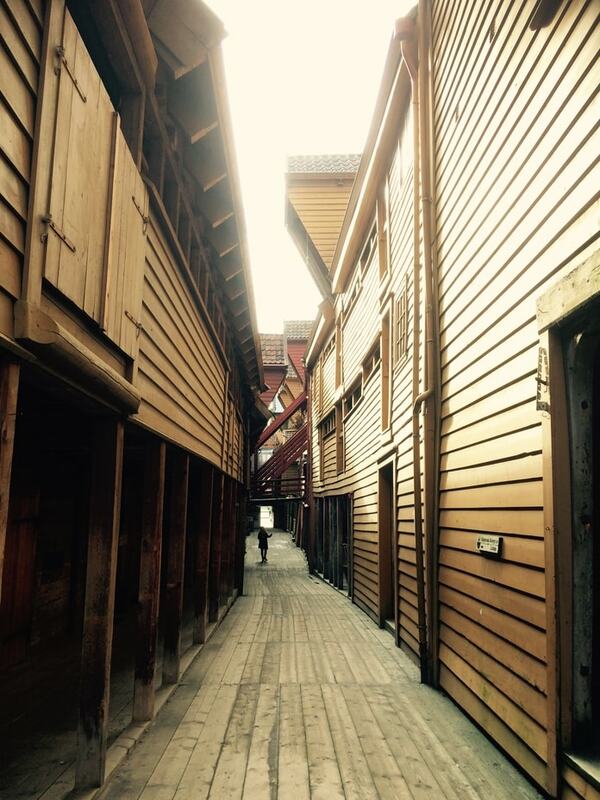 But the best way to enjoy Bryggen is to explore it. 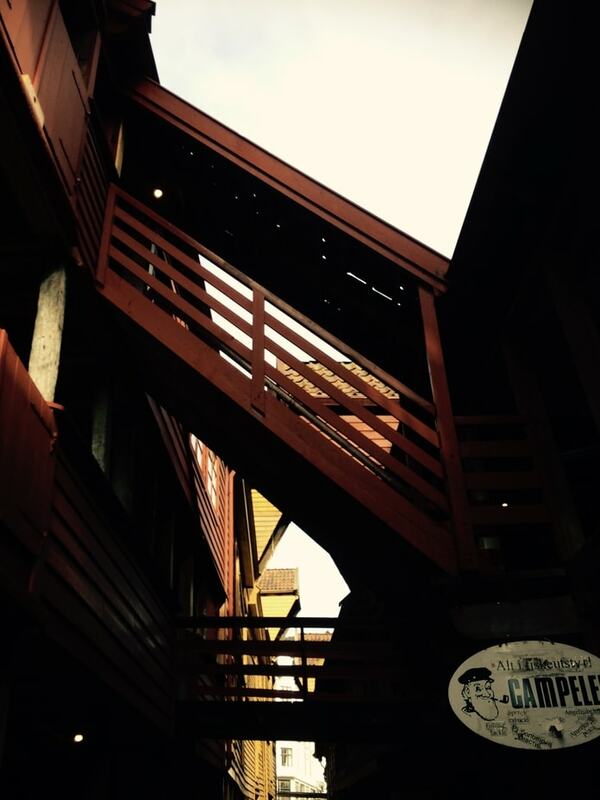 Bryggen is compact, full of local workshops, craft stores and art galleries. It’s a wonderful place to wander, through mismatched houses and crooked alleyways, with askew balconies and old wooden walkways. Some of the low doorframes lead to bars and restaurants. At night, they are a great place to sit outside, watching the dimming activity of the harbor. 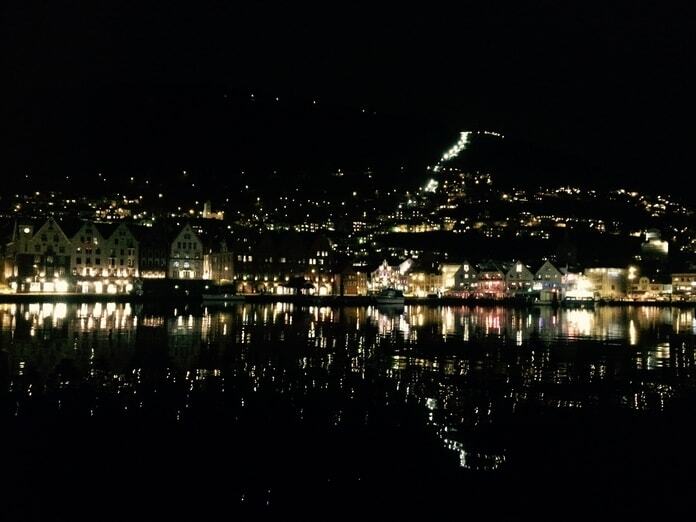 Be sure to go over to the opposite side of Bryggen at night. The view across of the harbor of the shimmering, illuminated front is lovely. 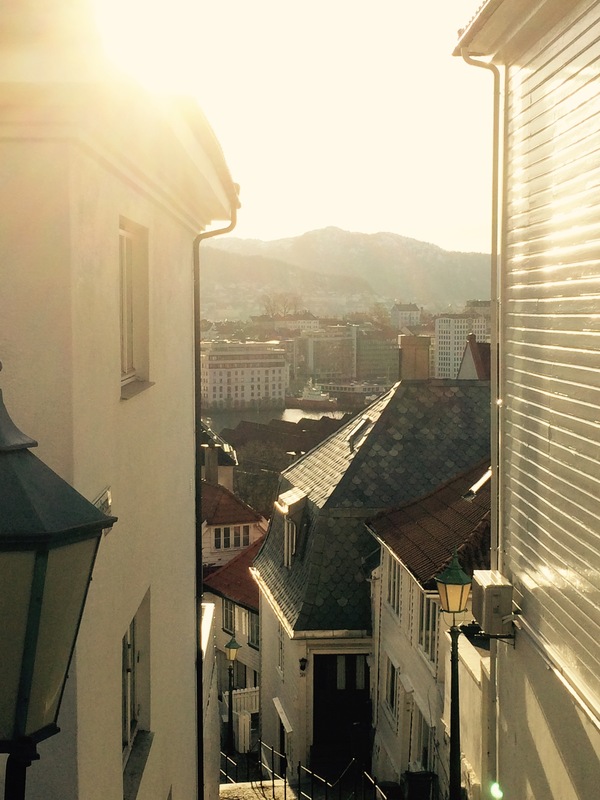 It lies beneath the shadow of Mount Fløyen, lined with house lights and the bright track of the funicular. It’s a beautiful perspective of the city. Every time I thought I had found my favorite spot in Bergen, I would go further up a mountain or closer to the sea and find a new one. Bryggen isn’t the only gem of Bergen, and many of the most beautiful spots are unexpected and understated. The city is full of surprising and wonderful views around a corner. It’s easy to relax in Bergen. Coffee is more affordable than alcohol, so it’s not expensive to spend time in a cafe. Most the time, Norwegian cafes offer free refills on filter coffee. So you can stay and work or study for hours. I liked Godt Brod beside the Mount Fløyen funicular station. Organic ingredients and a great window to people watch the slow movement of the city. Byparken is a central and good orientation spot in Bergen. 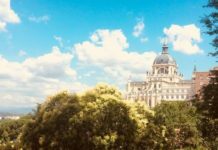 It is adjacent to a lake in the middle of the city, lined with trees, grass, benches and offering spectacular views of the mountains in the background. 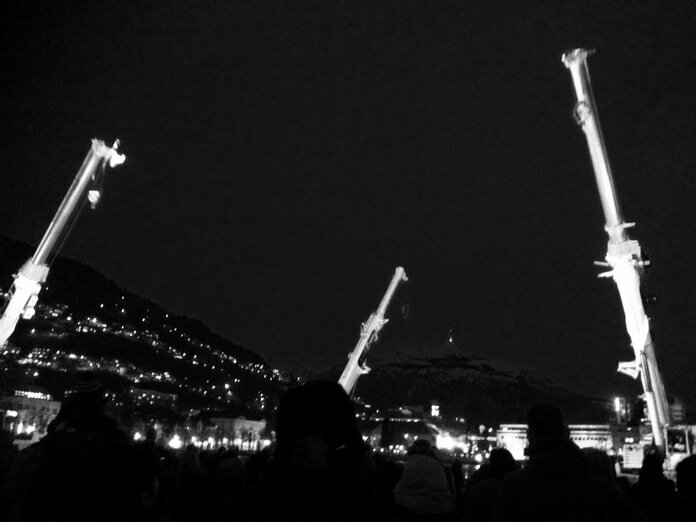 When I arrived, there was an event celebrating the final day of the Borealis Festival. 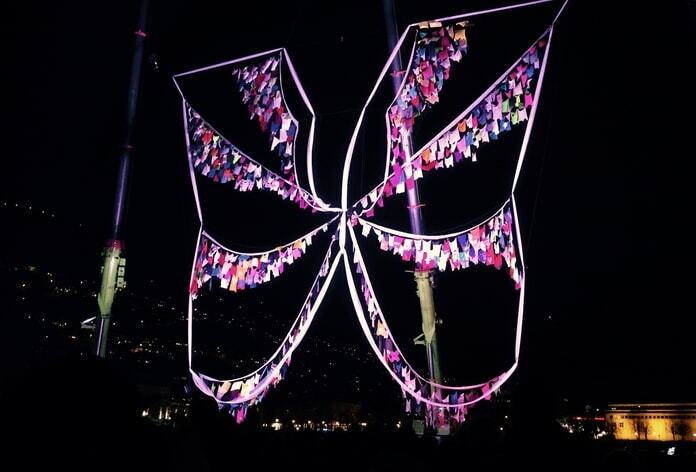 The performance including dancing cranes carrying colorful ribbons and moving to experimental electronic music. 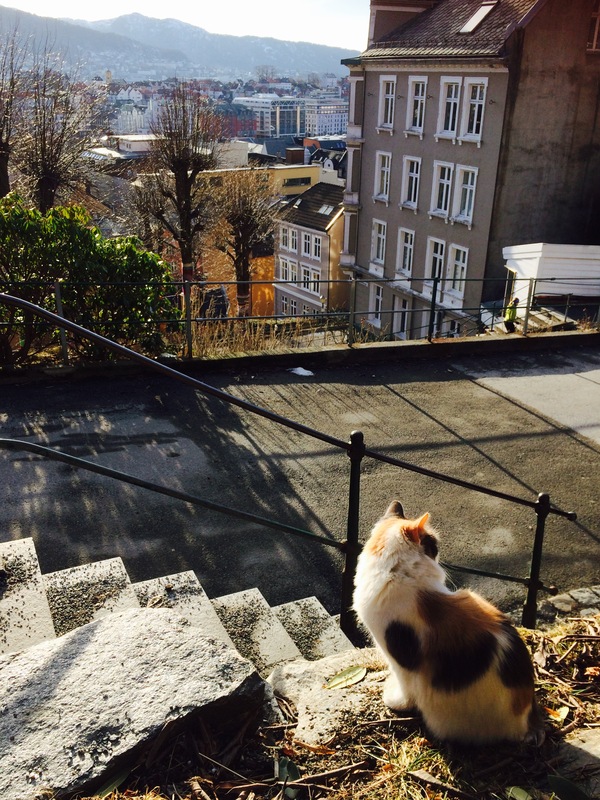 Although Bergen is small, it’s difficult to say that it’s predictable. Not far from the park is the harbor, which buzzes with moving boats and activity. Here is the fish market, another famous attraction of Bergen, full of fresh catches from the North Sea. Above the market is the tourist information. At the end of the headland is Bergen Aquarium. Even if you don’t go inside, it’s well worth the view from the headland anyway. The most walkable furthest spot from town, it’s the closest you can get to the expansive coastline. The view is immediate, of a stretching ocean with scattered islands on the horizon. The best place I found in the city for the sunset. I spent my other days in Bergen city at Marken Gjestehus. This central hostel had an authentic traveler vibe and was a great place to meet people from around the world. 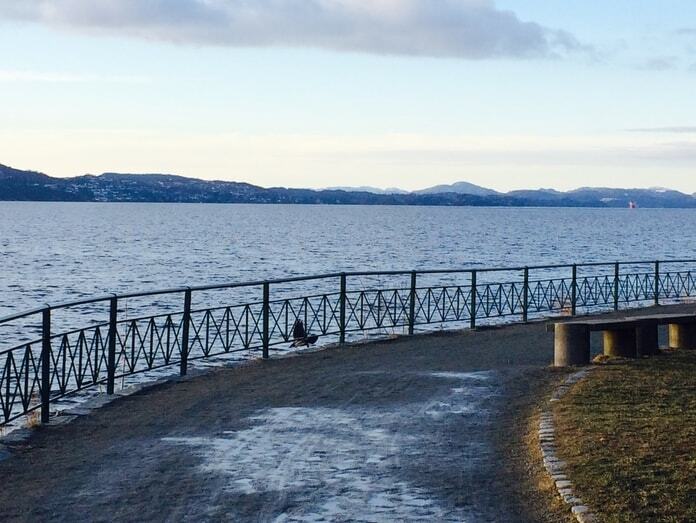 Used as a rest stop by people enjoying the activity of Bergen, it holds a fresh and energized spirit. It has a great kitchen to make food at the end of the day, allowing you to stick to your budget in an expensive country. Marken Gjestehus, however, is entirely affordable. 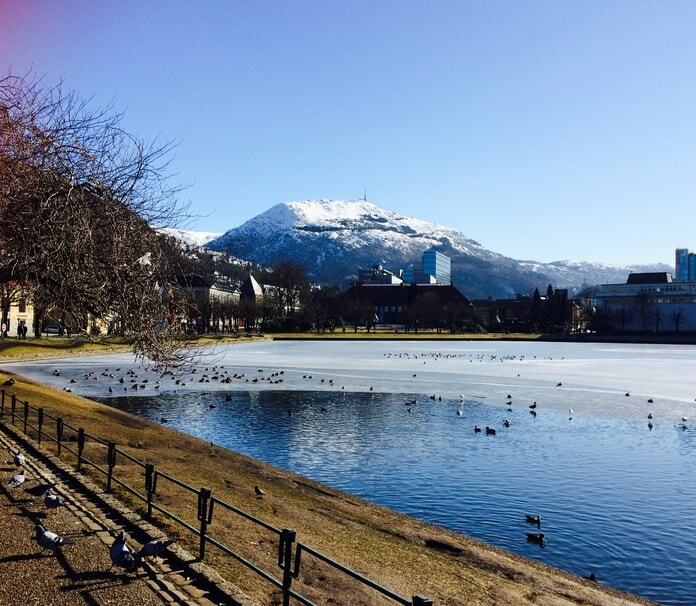 It provides comfortable basics for those wanting to enjoy Bergen without spending a fortune. All rooms and facilities are clean and cozy. There’s plenty of space to lounge and rest your legs. 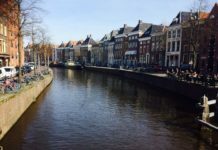 Plus, the guesthouse is located in a small and beautiful street, close to bars, cafes and a supermarket in a local part of town. Welcoming staff, perfect facilities and ideal location, Marken Gjestehus is everything you could want from a stopover in Bergen. The city by the seven mountains, Bergen is literally surrounded by nature, and not just nature, but epic and glorious scenery. It’s a hotspot for outdoor enthusiasts, drawing skiers, hikers, climbers, from around Norway and Europe. But anyone can enjoy the surrounding mountains. 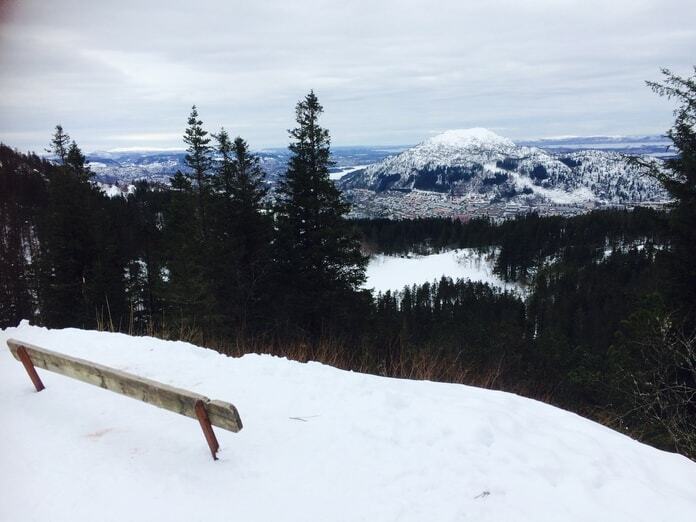 One of the most accessible is Mount Fløyen. There is a funicular in the center, which carries people straight up the side of the mountain, from locals carrying their shopping to tourists looking for an amazing view. The sight from the top is spectacular, with a perspective of the whole city and a view of the open ocean in the distance. From here, you can take a number of footpaths to explore the mountain. 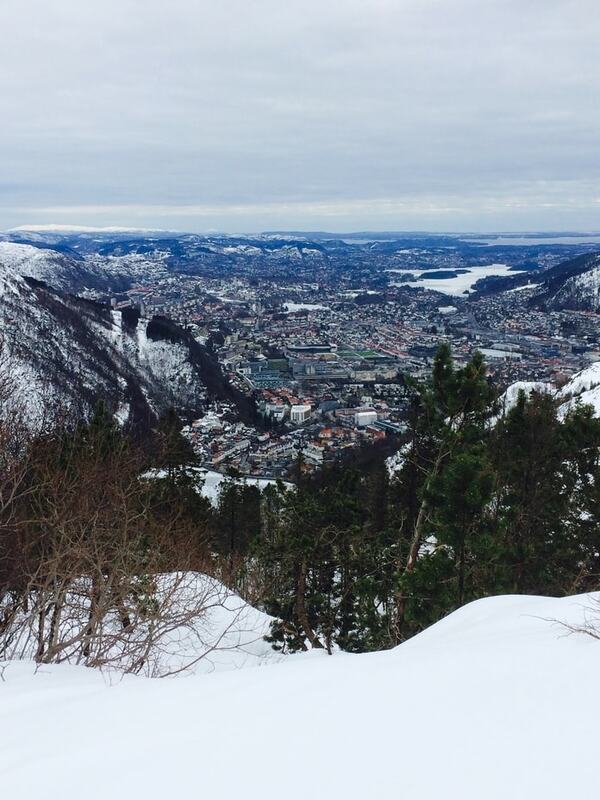 Some are harder than others, but it’s a relatively easy hike to the peak of Mount Fløyen. As you walk higher, each view is more and more incredible. 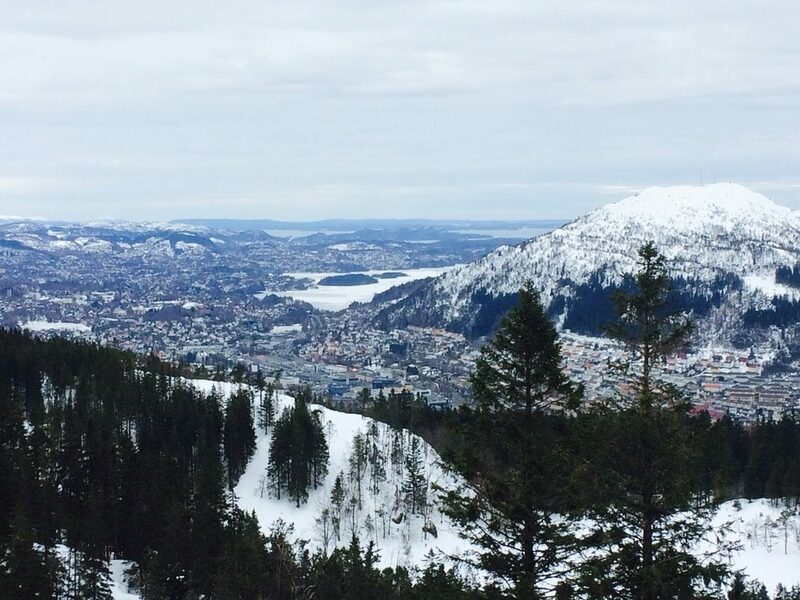 Circling the peak, you can see behind Bergen and the inland mountains of Norway. You could spend days exploring the footpaths on this one mountain, as many people do. Yet there are six more to discover, just in proximity to Bergen. 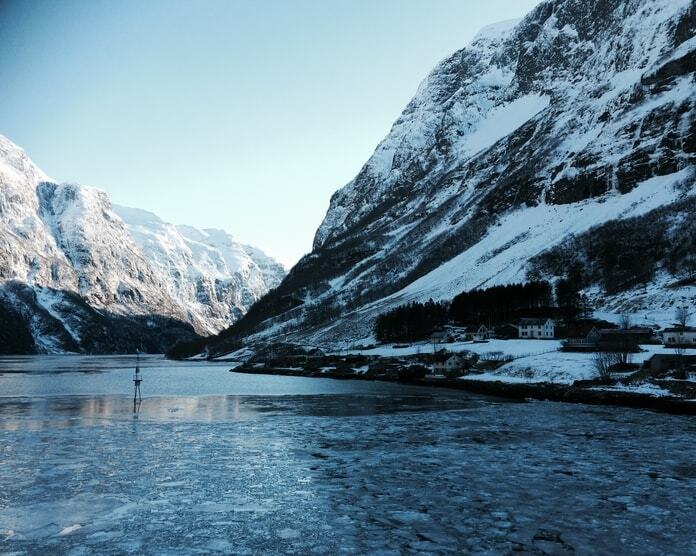 Another popular choice is Mount Ulriken, which you can journey up via cable car. 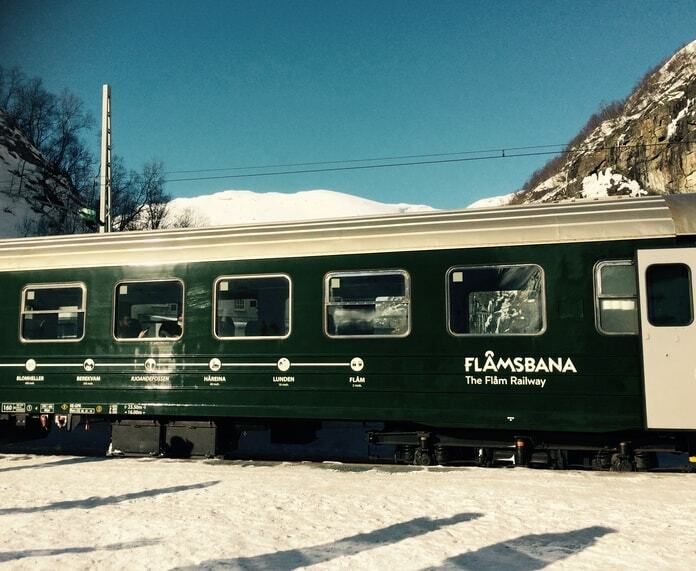 The Flåm Railway is one of the most celebrated railways in the world. It’s known for its astonishing scenery, winding pathway, and steep incline. Starting from Myrdal at 867 meters, it travels down to Flåm at sea level. An old-style train with classic carriages, the train travels slowly, stopping at major natural landmarks along the way. You can even get off at one platform to witness the impressive Kjosfossen Waterfall. It’s a great journey to take in any season. I was there in the winter when the scenery was white and majestic, the waterfall was frozen, and the snow from the mountains blew onto the windows. 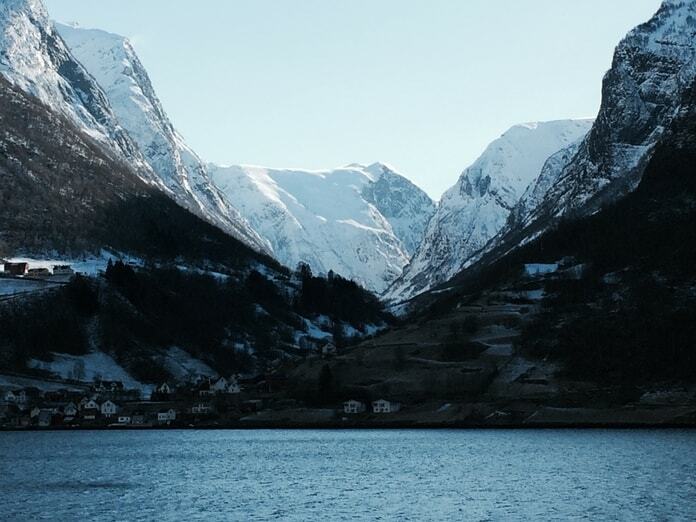 You arrive in Flåm in less than an hour. 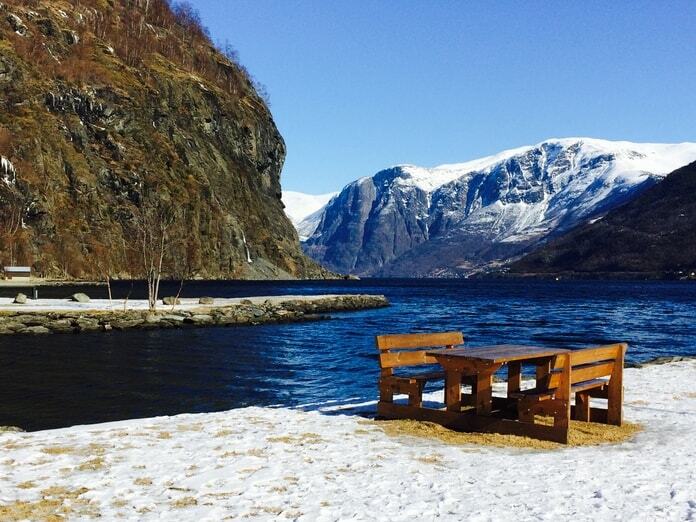 Surrounded by high mountains and sitting on the edge of a lake, Flåm is incredibly beautiful. It’s also tiny with only a handful of buildings – a few hotels, a shop, restaurant and a hostel and campsite open in high season. Walkable within ten minutes, most people visit Flåm to relax in fresh cold air, hike, or follow the lake to the fjords. 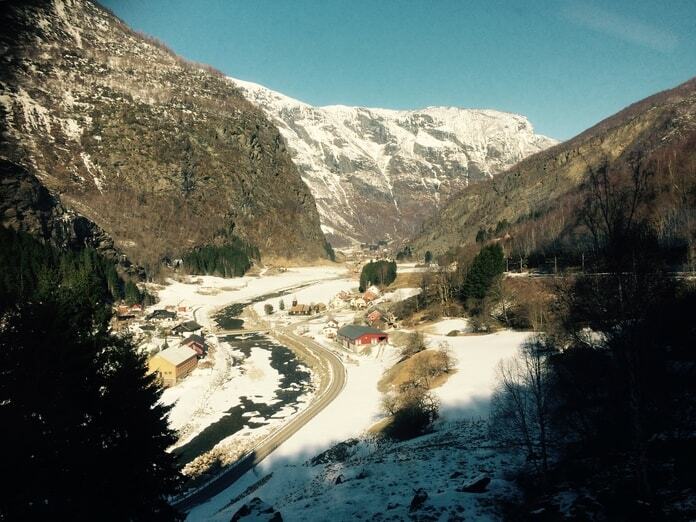 I did the Flåm Railway and Fjord Cruise as part of the Norway in a Nutshell tour, a round day trip from Bergen. It’s not cheap, but it is definitely worth it. 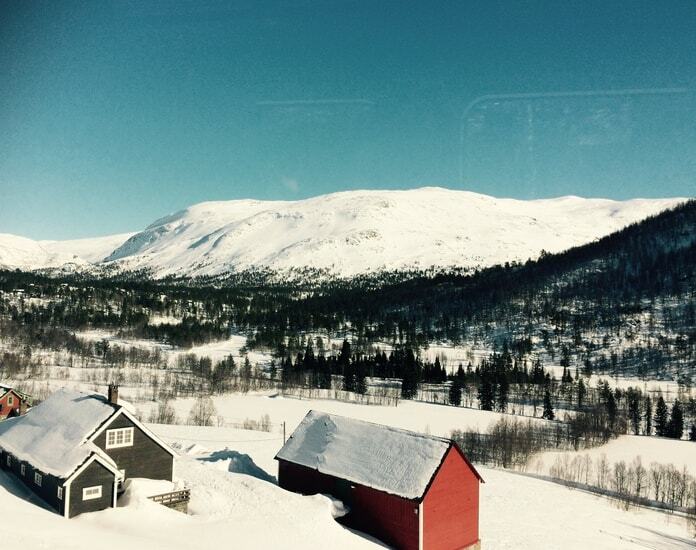 The views were already incredible from the first section of the journey, from Bergen to Myrdal, part of the train ride from Bergen to Oslo. Another train track famous for its stunning nature; take the 7-hour ride if you can to Norway’s capital, as it’s an incredible journey straight through wild landscape. 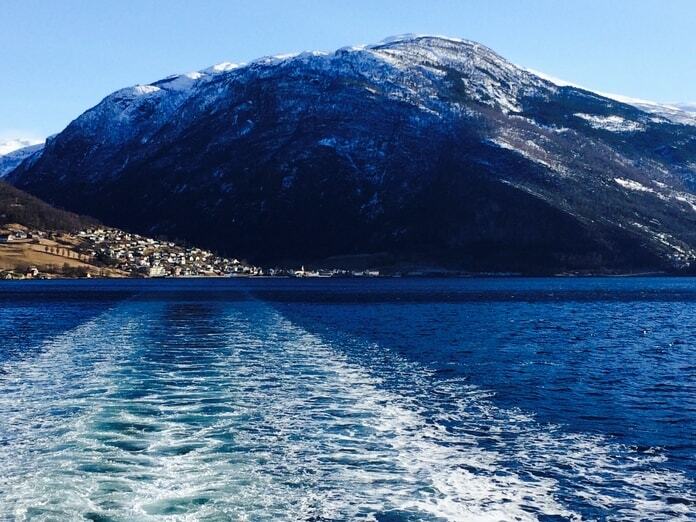 After the Flåm Railway and a stopover in Flåm, we boarded a ferry to take us into the fjords. The deck was windy leaving the harbor and soon became freezing, but it was impossible not to stay outside and enjoy the views. The scenery was almost indescribable and I couldn’t stop taking pictures, all of which gave the scene in front of me almost no justice. 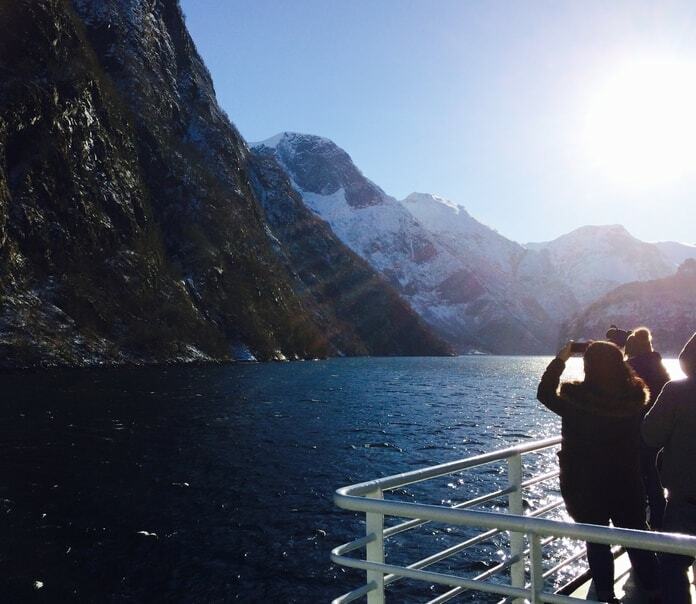 We traveled through the Aurlandsfjord and Nærøyfjord, two of the most textbook examples of this natural phenomenon in the world, and both part of the surrounding World Heritage Area. The boat followed the varying widths of the valley. Sometimes we moved through the middle of the lake, with wide perspectives of the cliffs and mountains beyond. 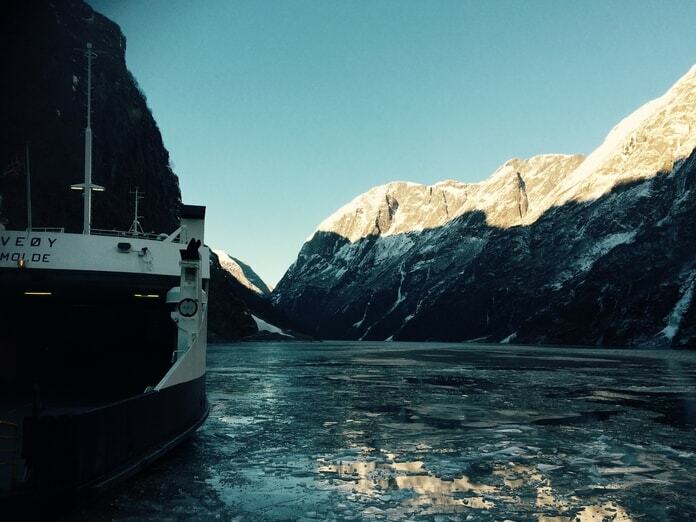 Other times, the boat took a narrow path through the fjords, which would tower above, giving no perspective but the steep and endless cliff face. When we passed shallower sections, the water had frozen on the surface. 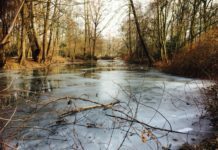 The boat ruptured the ice, gliding through effortlessly and sending ripples through the icebergs, which cracked open in succession with the waves. 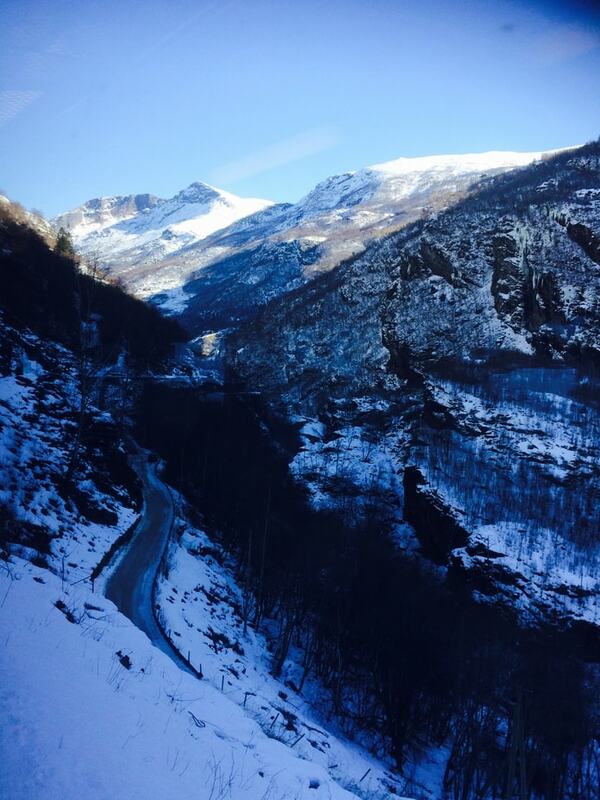 After two hours, we arrived into Gudvangen and took a local bus back to Voss for a train transfer to Bergen, cold from the icy air of the fjords and fresh from its stunning beauty. Travelling Norway, I couldn’t shake the comparison to Canada. Such epic nature that I could never experience in England and the vast scale of it all, the possibility of getting truly lost in the wild, and the indifferent harshness of the landscape. Or perhaps it was the sense of feeling far from Europe. Either way, Norway was an exceptional place, incomparable to anywhere else I’d ever been in the continent. A week later when I traveled to Sweden, I saw the similarities of another Scandinavian country. 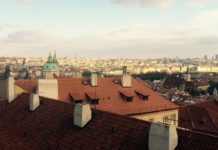 But I realized the uniqueness of this northern section of Europe, far away from the cute town squares, historic landmarks, street side cafes, canals, cobbled streets and countryside I was used to enjoying. Instead, I’d touched upon a distinct raw remoteness, and I was left with a lot of joy, energy from the fresh air, and the ache to return and travel further north. However much I loved Norway, I’d only seen a tiny dot on a massive map of land, and I wanted to see more.